BUILDING POSTURE. After two centuries of gradual settling into its original site, this colonial structure was dismantled and re-established on a new, level, monolithic concrete foundation. Much of the work of time upon the original structure will be lost as the demands of new construction plumb and straighten its lines. After centuries in direct contact with masonry near grade, damage to sill beams is very common, and although generally unseen, original framing and underlayment help to determine the characteristic lines and bearing of the building. When not available, replacements can be devised from period salvage and new lumber of native species. Original materials are the most reliable way to recreate the look, feel and smell of period work at a new site. The veracity and presence of historic finished work is practically impossible to counterfeit in brand new construction. Historic structures are rich with eloquent character, unique craftsmanship and proven, coherent design and they are often available for virtually nothing as developers are under pressure to make a good faith effort to find these important artifacts a decent home. As long as there is real estate development, there will be available a steady supply of sound, historic structures condemned only because they were in the wrong place at the wrong time. Moving these structures intact, like the original builders’ generation often did, has become difficult due to the growth of traffic and overhead wires. To identify issues critical to the successful acquisition and dismantling of a period structure and its reestablishment at a new site, we consult with William Gould of Pomfret Center, Connecticut, a preservationist who specializes in relocating period buildings. William Gould believes that it is most efficient that the building contractor and dismantler be one and the same. 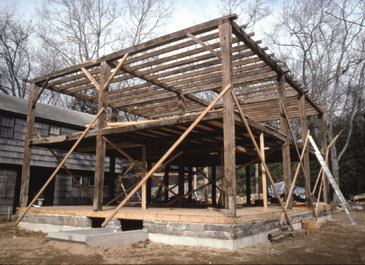 Dismantling a complete structure for rebuilding at a new site is a skill intensive operation integral to the process of both design and construction. Dismantling is a meticulously documented deconstruction of the original for the specific purpose of acquiring sufficient material to meet the needs of the customer for historic veracity. The dismantler will assess the potential of the materials and should understand and share the owner’s vision for the new structure. The most reliable way to recreate the work of time and the original artisans is to incorporate as many sound framing, finish and sheathing elements as the structure will yield. Since some elements will be lost to time and attrition, the final yield of the building will not be known until it has been established what undamaged original fabric lies beneath any modern finishes. Dismantling is itself a work of interpretation and discovery of what is essential to the successful recreation of the structure at the new site. The builder is limited to installing what the dismantler furnishes. The final scope of the project will therefore not be established until this inventory is known. In furnishing this documented inventory, the dismantler is reading and transcribing a blueprint furnished by time and the original builder. Preserving the eloquent character of the original fabric in a new sound construction takes patience, passion and experience. The building contractor is not simply moving the original structure but is reinterpreting it. Much of the original look and feel of historic work derives from the liberties it takes with straight, level and plumb. These deviations have been imposed by time and gravity and may not be consistent with new building construction. The new building will most likely be set on a level foundation resulting in numerous judgment calls as the building takes shape. What, for example, do we do with the door that has been recut many times over the years to accommodate a settling floor and racked door opening? Should the door be rehung or recut again? Should the frame be altered or should a larger attempt be made to simulate the dips and deflections of the walls and floor even though the foundation settlement that caused them has now been corrected? Should damaged framing and sheathing elements be replaced by native lumber or select period salvage? Unless the builder is determined to address all of the elements that contribute to the structure’s expression of its history, its story will be lost in the trauma of reconstruction. It is at the point of purchase, however, that the experienced artisan can make the greatest single contribution to the project. An experienced artisan can confirm that the material necessary will be yielded by the structure, within budget. A period structure introduces a disruptive unpredictability into the construction process that requires skilled management from the outset. Clients who have been seduced by the beauty and vulnerability of a condemned historic structure and who believe that they are getting a bargain by paying little for it may not be fully aware of their peril (see Documentation of Dismantled Historic Fabric). They are making a defining decision that will bear heavily on the cost and outcome of the project. Historic materials lie outside the canon of current construction practices. Only an artisan who has had the patience and commitment to develop a nose for them can determine their potential. William Gould believes that to be qualified the contractor must share the client’s vision and passion for the historic structure and be experienced enough to furnish reliable costs and schedules. List of Building Documentation Specialists. This entry was posted in Dismantling, New Construction and tagged Connecticut, Dismantled Materials. Bookmark the permalink.